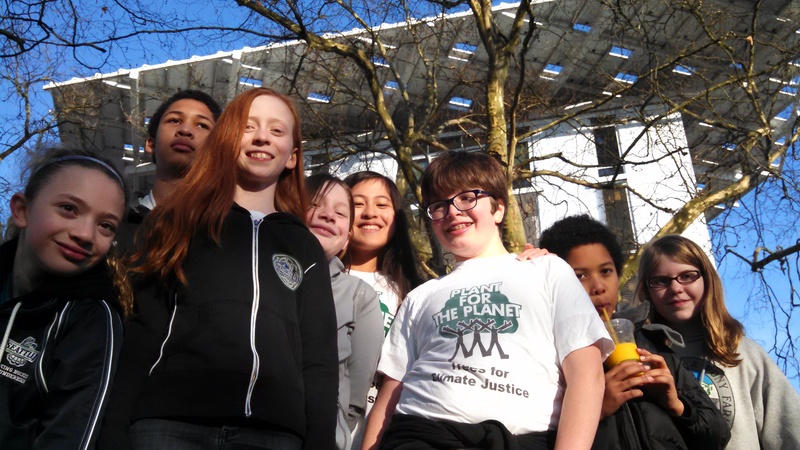 As a whole, Plant for the Planet Seattle got an experience of a lifetime. We got to go to the greenest office building in the world, and meet the amazing man who started it. “Denis Hayes created the Bullitt Foundation an attempt to safeguard the natural environment by promoting responsible human activities and sustainable communities in the Pacific Northwest.” (straight from the webpage). First, we ascended the stairs (with a quick bathroom break beforehand-they were amazing) to a meeting room, where we told Dennis Hayes a little about Plant For the Planet. We then had a (quite in-depth) conversation about the Bullitt Center as a whole, even though Dennis had somewhere to be. He told us all about the building, it’s energy independence, even how the toilets worked! He gave us a tour of the waste water treatment in the basement. He was willing to listen to all of our questions and give informative answers, no matter how silly they were. We then went to a smoothie place across the street and played in the park. All in all, the experience was very inspiring, and Dennis Hayes was very kind to us. ​nick is pictured in front sporting the always-fashionable Plant-for-the-Planet t-shirt, free for Ambassadors at the Academy. If you’d like to become an ambassador or know a friend to invite, (our activities are always free) you can sign up for the next Academy in Seattle, March 14th at the Duwamish Longhouse. We have more Academies this school year on Whidbey Island, Bainbridge Island, Enumclaw, and Port Townsend. You guys are always doing something cool for our environment. Thanks for the recap.